Sausages are great, but hot dogs have never had a strong hold on me. Yes, I like the charred ones at Gray's and the topped ones at Red Hot Lovers, still, I rarely crave a hot dog. Luckily, Hank's Haute Dogs serves both Chicago dogs and an interesting array of sausages. Over the course of several weeks, we had the pleasure of sampling: the Chicago dog, Chorizo, Lobster, Duck and Foie Gras, Chicken and No Dog. When a Honolulu establishment goes so far as to bring in Vienna Beef Hot Dogs, you know they are serious. 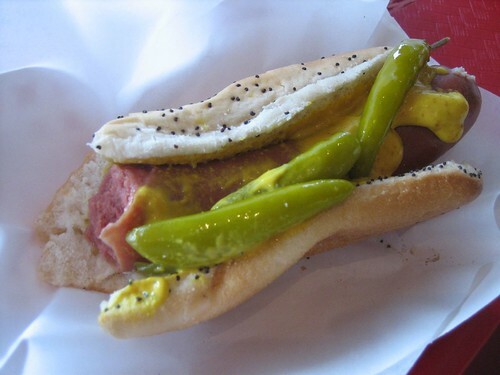 I started with a Chicago dog with sport hot peppers, celery salt and mustard on the traditional poppy seed bun. Nice snap from the natural casing, and points for the Chicago toppings. J's favorite was the Chorizo, a smoked sausage grilled and topped with brown mustard, cooked onion and cilantro. The sausage was smokey with nice char marks, the onion was cooked and had a mild vinegar flavor. I often have huevos con chorizo for breakfast and this chorizo had less grease and salt than those found at my taquerias, perfect for a sausage in a bun. We were both surprised by the Chicken sausage. When J ordered it, I suspected it would be dry and bland. In fact, it was juicy, flavorful and well paired with a mango relish. Both of us would order this again especially when with the Lilikoi and Lime drink. Another high note for Hank's is the onion rings served coated in a light panko -- crunchy and well seasoned, though the portion is a bit small. The french fries are nothing special and probably worth skipping to save room for an extra dog. For next time, we'll definitely try to make it in for the Kobe Dog and the truffled mac n cheese.